Kurdish fighters in north-east Syria have taken control of a border crossing with Iraq from Islamist rebel groups. 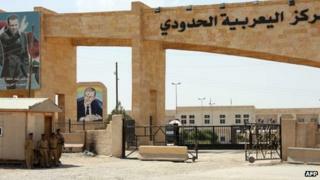 The Yarubiya border post was captured after three days of clashes with groups linked to al-Qaeda, the fighters said. Officials on the Iraqi side of the border said they could hear heavy gunfire and shelling. Kurdish groups in northern Syria have tried to stay out of the civil war between the government and rebels. However as Islamist rebel groups have moved into Kurdish-controlled areas in recent months, clashes between them and Kurdish militias have been increasing. An Iraqi official told the Associated Press that the Baghdad government had brought Iraqi reinforcements to its side of the border to prevent the violence spilling over. He described the fighting as "heavy battles in which all types of weapons were used". The border crossing was under the Syrian government's control until March, when it was taken by Islamist rebels. Syria's Kurdish minority makes up around 10% of the population and is largely concentrated in the country's far north-east, near the borders with Turkey and Iraq. The fighting between jihadist rebels and armed Kurdish militia - both of whom are anti-government - adds another layer to Syria's complex civil war.